Villa Despina is a recently built two storey building with 4 bedrooms located 1 km from the villages of Asomatos and Lefkogia in the mountainous area of southern Crete. The villa can accommodate up to 12 people and has a pool with a children's pool, sauna, hydro-massage, barbecue and playground for children. For more information please do not hesitate to get in touch with us ! The open plan ground floor has a living room with a double sofa bed, satellite ?V and radio/CD player. Also the living room is equipped with a firing place. Leading off this there is a fully equipped kitchen, a dining area, the sauna and hydro-massage. There are two ground floor bedrooms, one with a double bed and one with twin bed, two bathrooms, one with a corner bath/shower/WC and washing machine, and one with a shower/WC. On the first floor there are a further two bedrooms, each with one double bed and a single bed and a further two showers/WC. All of the bedrooms open up to either a balcony or a sun terrace with patio furniture offering a variety of views over the magnificent surrounding countryside - the Kourtaliotis gorge, all the way to the sea. All bedrooms have air conditioning for extra local charge, two of them have a TV and three come with a little fridge. For cooler spells the house is also equipped with central heating for extra local charge. 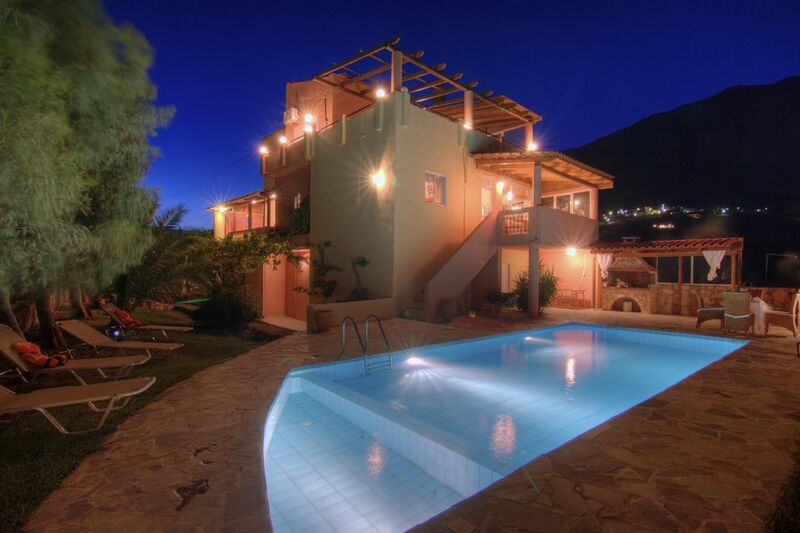 Villa Despina is close to the traditional Taverna of Despoina. Same owners, same quality! The food is homemade and the ingredients are homegrown. This facility will accompany your accommodation, if you wish, and although your privacy is our priority we offer the option to socialize, eat, drink and feel Crete all over. The owners offer a 8 EURO (3 course meal) per day / per person in the Taverna right next to the house. The meal includes salad, main course and dessert. Contact us for more details. We ll be very happy to assist in any way. If you need it it is extra 10 euro per day for the whole house. The property is really nice,big,comfortable and clean.The swimming pool and the garden are also big and nice. We explored the whole island staying at this property and we reccomend it in order to have some great holidays with your family or your friends. The villa was exceptionaly clean. I recomend it to anyone that wants to spend his holiday at a beautiful place and get the most out of it. It was wonderful.It was clean with a great pool and garden and very friendly owners. Nous revenons juste de notre séjour, lieu à recommander (ne pas trop le dire car trop de touristes afflueront...). maison spacieuse, propre et régulièrement nettoyée durant notre quinzaine, avec changement des draps et des serviettes réguliers. Lieu idéal pour découvrir les plages paradisiaques du sud de la crête (toutes sont bien dans le secteur, 30km à la ronde, préférence Prevelli et Shinaria). La région est assez sauvage, magnifique et authentique, pas trop dénaturée par le tourisme de masse. les prix dans les tavernes sont abordables sur l'ensemble du secteur. Ne pas craindre le vent qui est assez fréquent et peut souffler fort parfois, dans ce cas n'hésitez pas à partir en ballade après Plakias. Enfin il convient de remercier encore une fois les propriétaires, très sympathiques, serviables, adorables, et de bon conseil pour visiter le secteur. the clients were very good people,friendly,polite and very very clean people.i wish they had a good time and see them soon.